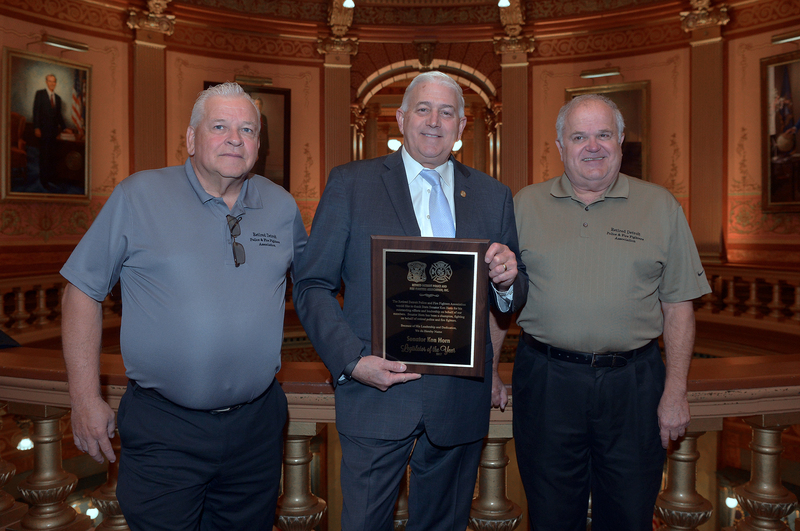 LANSING, Mich. — State Sen. Ken Horn on Tuesday was named Legislator of the Year by the Retired Detroit Police and Fire Fighter Association (RDPFFA). RDPFFA President Don Taylor recognized Horn for his continued efforts to allow firefighters and police to increase income deductions for their pensions in order to cover benefits that are not covered by Social Security. Editor’s note: A print-quality version of the above photograph is available by clicking on the image or by visiting the senator’s website at www.SenatorKenHorn.com. Click on “Photowire” under the Media Center tab. 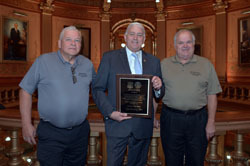 Photo caption: State Sen. Ken Horn, R-Frankenmuth, stands with Don Taylor (left), president of the Retired Detroit Police and Fire Fighter Association, and Al Grant, secretary/treasurer of the association.